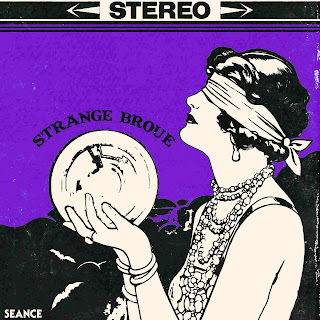 Having had a great time with Strange Broue's debut album, I was excited to see that they had another release coming out early this year. And while it was described as an EP, the forty minutes of material to be found in Seance deliver more than the average helping for that format, with plenty of acid-stringed guitar, thick waves of bass, and slow-paced percussion to fill your bedroom as your speakers start to smoke. In keeping with the precedent set by the self-titled LP, Strange Broue pluck some excellent samples to spice up the tracks, this time with a focus on the insidious threat of Satanism to society and all it holds dear. There's a sense that things are less jocular this time around, as they've swapped track titles such as “Electric Blizzard” and “Kult-Aid” out for the likes of “Kill What's Inside Of You” and “Satan's Slaves”, but the good ear for riffs and grooves is still there, just tuned to a darker frequency. Along with those cosmetic alterations, it appears that the band has grown from a one-man outfit to a quartet, if the pictures of bearded weirdos out in the wood are to be taken at face value. While that does change up the chemistry somewhat, it's nice to see Strange Broue getting some traction under their feet on the road to becoming an enduring institution, and with the inclusion of some atmospheric interludes like “Seance IV – L'invocation”, as well as the amazing sample collage of "Cults and Crimes", there's reassurance that they won't rest easy on their blood-stained laurels. Orders for the lengthy EP (in cassette format) from Sunmask Records open up on the 24th of this month, so don't let this one slip past you if you dig on occult psychedelic stoner doom!